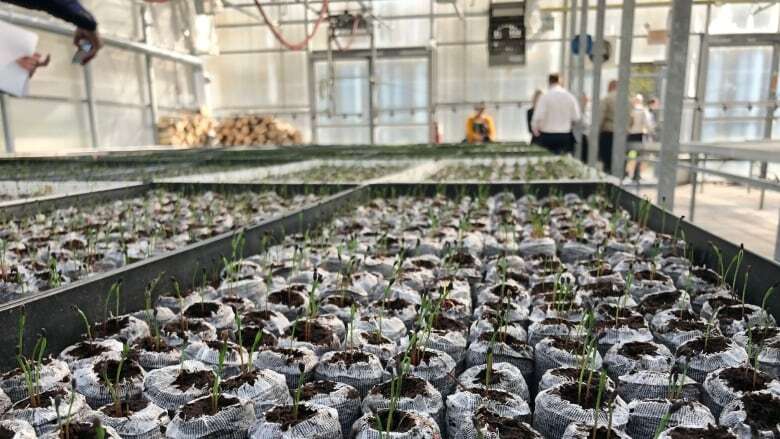 As trees lose their leaves outdoors, things are budding inside Collège Boréal's new and expanded greenhouses. The Sudbury college celebrated the opening of a new greenhouse on Tuesday as part of its revamped Biodiversity Centre. As trees lose their leaves outdoors, things are budding inside Collège Boréal's new and expanded greenhouses. The Sudbury college celebrated the opening of a new greenhouse on Tuesday as part of its revamped Biodiversity Centre. The renovations also include a new classroom, an open-air garden for seedlings and a drive-in freezer. The college says the goal of the centre is to allow students and local industries to collaborate more closely on research, which will focus on regreening efforts and new agricultural opportunities in the region. "We are aware that the growing season is changing," Daniel Leduc, the dean of trades and applied technology, said. "What is being grown in Sudbury, in Hearst, in Kapuskasing is different than what was being grown 30 or 40 years ago. This will be an opportunity to really go forward to the next step without forgetting our first mandate of regreening in Sudbury." The centre's existing greenhouse was built in 2009, and is where many of the trees planted across the region as part of re-greening efforts over the past decade have been nurtured. Among the species currently budding are white pine, jack pine and cedar — but also a pair of orange trees. It's all for the sake of experimentation, explained Leduc. An eye-catching pinkish-purple colour glowed over the plants on Tuesday. 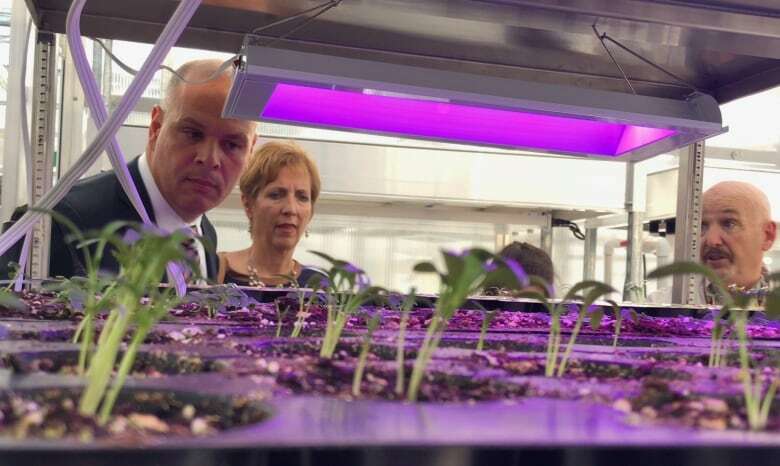 Leduc said the new lighting is up to four times more efficient than the previous lighting, and the different colours allow plants to be grown under different conditions. "You're seeing the pink today, but you can go into blues, and different colours. The plants will react differently to different colours," he said. The newer greenhouse is equipped with dials that control settings, including cooling, air circulation and the amount of water the plants receive. It's also divided into different zones. One zone is focused on hydroponic and water-based plants, while another houses exotic plants like cactuses, where students are experimenting with different growing conditions. Leduc said about 60 students in the forestry and agriculture programs will be the biodiversity centre's primary users. Another major goal is for the centre to become "business incubators," to allow students and industry to collaborate on new research and ideas, he explained. 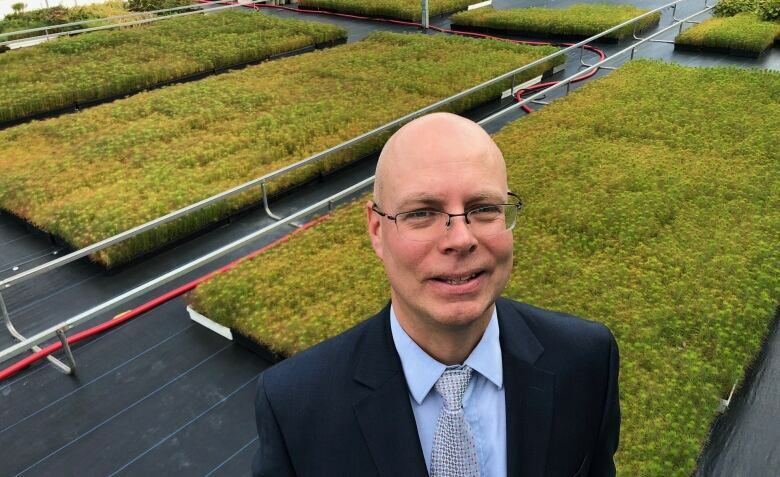 "We've got students that are learning, we've got the controlled environment, and a local producer may want to see what happens if there's more moisture, less moisture, different lighting," Leduc said. "Some of these projects are currently done out in the field, and with the growing season being what it is, you've got a set amount of months you can try something, as opposed to here, we'll have an extended growing season and will actually be able to do research year-round." A number of federal and provincial members of parliament were on hand for the official opening. The federal government provided half of the funding for the $3 million project, while the province contributed $200,000.